In December 2013 the first Ebola cases surfaced in Guéckedou district, near the Liberian and Sierra Leon borders in the Forest Region of Guinea. The outbreak quickly spread from Forest Guinea to the rest of the country and, through the borders, to neighbouring countries. It took three months to identify the Ebola virus as the causative agent of the burgeoning epidemic, longer for the Guinean government to understand the importance of treating the outbreak as a national emergency, and even more time for everyone involved to appreciate the great social toll of Ebola. As the epicentre of the epidemic, Forest Guinea felt the brunt of the disease and of the sudden intervention of outsiders into their communities. For a region where the State had previously been all but absent and even mistrusted, there was great resistance towards health care workers and outbreak control teams. Violence shortly followed. The most serious episode occurred in mid-September 2014 in Womey, an ethnic forestier village located in an area of major international mining interests near the region’s capital of Nzerekoré. Villagers who suspected a government-led health education delegation of in fact spreading the virus killed eight members of the team. The government reacted by militarising the town. The scared inhabitants fled into the surrounding forest for several weeks as fear of a government reprisal and rumours of former ULIMO and Dozos militias among the army circulated. Looting and lawlessness ensued. It was not until November of that year that residents could return to their village. The cultural, social and political environments in Forest Guinea have developed a complex matrix of structures that renders the region both fragile and unstable. The Ebola outbreak, and in particular the Womey episode, should be taken as a paradigm that reflects the latent forces affecting the region. This is characterised by a combination of intercommunal tensions, disenfranchisement from power, and perceptions of insecurity. The aim of this short paper is to provide a socio-political framework through which the structural violence of the Forest Guinea region can be understood. Forest Guinea is one of four natural regions in Guinea and is the furthermost region from the capital. Owing to possessing some of the most fertile lands in the country and substantial mineral wealth, it is characterized by the unique cohabitation between native and non-native ethnic populations. The region was originally populated by various ethnic groups – Kissi, Toma, Guerzé, Manon, Konon and others – that are collectively referred to as forestier, and are part of larger regional networks (characterized by shared initiation rituals, kinship, and ethno-linguistic bonds) that extend across the borders of Sierra Leone, Liberia and Côte d’Ivoire. 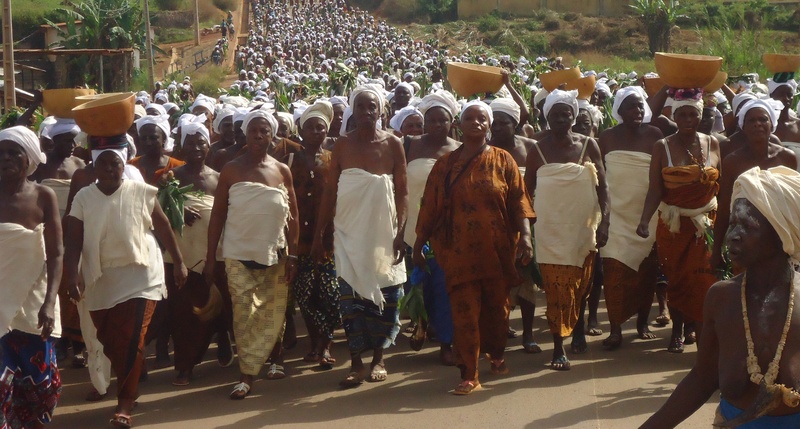 Forestier communities tend to follow a syncretic Christian-animist religion while the other populations are Muslim and considered non-native since most tend to have historical roots in predominantly Malinké Upper Guinea. For many years the inflow of external populations had been peacefully accepted by the native inhabitants of Forest Guinea. Foreigners tended to settle into cities or large villages where they became important actors in commerce and administration, leaving agriculture and especially rice culture in the hands of native forestier. This lack of socio-economic intermingling served the interests of both communities by allowing them to maintain their internal cultural cohesiveness. This arrangement began to be called into question with the liberalisation that followed the end of the Sékou Touré socialist system. Regardless of Touré’s aim to eradicate large personal land holdings and establish State ownership, the end-result in Forest Guinea was a de facto appropriation of ancestral proprietary rights by non-native tenant farmers. Additionally, and more recently, the massive influx of refugees fleeing war violence from neighbouring countries and the onset of large-scale mining further reduced land availability and thus contributed in weakening the social fabric of the region. The main reason why land competition between native and non-native groups becomes an open conflict, and then quickly evolves into an ethnic dispute is due to the near impossibility of finding mutually acceptable arbitration for these communities. It is a fact that formal justice institutions are both costly and inefficient and most Guineans rely almost exclusively on traditional authorities to solve local conflicts. If in Guinea land conflicts mediated in this way are by and large peacefully solved, in the Forest Region disputes can barely be managed at the local community level because of the lack of a common acceptable authority to which to turn, and therefore, when personal disagreements over land occur, they can turn into intercommunal conflicts. Throughout the years land competition, and therefore land disputes, fostered a substrata of intercommunal tensions that created a breeding ground for other types of conflicts to develop. Christian-Muslim disagreements are becoming common as socio-political tensions bring them to the forefront. However, communal frictions attributed to religious intolerance are in fact part of a larger framework of conflicting social practices related to gender, culture, and kinship that makes inter-ethnic integration difficult and the social tissue fragile. A case in point is inter-religious marriage, which the forestier tolerate and the Malinké regulate: while Christian forestier women may take on a Muslim husband, Muslim women are not allowed to marry men from a different religion than their own. What could serve as a strong social link between groups is in fact a source of tension and distrust. Another example is the forestier initiation ritual. Following a Sekou Touré initiative that targeted all forms of cultural practices considered primitive – especially polytheistic cults such as religious fetishism –, forestier were forced to convert to a monotheistic religion. Some chose Islam, though the large majority converted to Christianity in order to guard their ethnic distinction from the Malinké non-native community. The end-result was that forestier youth were forced to cross national borders in order to follow social tradition and be initiated into their communities by forestier groups in Côte d’Ivoire, Liberia and Sierra Leone. This left a deep cultural scar among forestier communities who to this day view the national government as extraneous and hostile to their culture and values. With the first democratic reforms in the 1990s ethnic rivalries acquired a political dimension. Forestier started to look at the history of Guinea as a chronicle of disfranchisement and exclusion of forest people from power. The creation of a multi-party system in the early 1990s, and the subsequent ethnicization of political parties that built themselves around the already existent Bureaux de coordination régionale  increased the ethno-political divide in the Forest Guinea region. Political parties emphasized ethnic affiliation and their campaigning fuelled ongoing intercommunal rivalries around land-use policy and religious/cultural practices. In particular, Lansana Conté – an ethnic Soussou – exploited forestier frustrations in order to build political support in opposition to his traditional opponent Alpha Condé (and current president) – himself from the Malinké majority. Subsequently, forestier political interests were further impaired when forestier Dadis Camara’s short-lived presidency (Dec. 2008-Dec. 2009) was not only brought to an end by a Malinké officer, but was followed by the election in 2010 of a Malinké candidate, the aforementioned Alpha Condé. Most recently, long-delayed legislative elections in 2013 saw over 40% of voting stations in Nzerekoré electoral district invalidated in their entirety and nearly 13 and 25% of FPP votes annulled in neighbouring forestier dominated Yomou and Lola districts respectively; this helped give the ruling (Malinké dominated) party a solid win in the region. Most forestiers believe that the yearning for national relevance by the region has repeatedly been short-circuited by factional manoeuvring and unkempt political promises. Besides a non-functional state apparatus, government-initiated religious segmentation, and a history of political marginalization, forestier have suffered exploitation at the hands of outsiders and foreigners alike. As mentioned before, Forest Guinea is exceptionally rich in natural resources and several major foreign companies have large forest, agricultural and mining investments in the area. Given the vested interest of the state in almost all foreign-led projects, appropriation of land by the government is common. Those communities affected are offered compensation (labour and/or infrastructure) by both the state and the multinational companies involved, however these agreements are seldom respected and protests are frequent. Rather than mediate, the government oftentimes represses these demonstrations. To the aforementioned intercommunal stress points and the perennial government antagonism that permeate the Forest Guinea region, we must add a chronic perception of personal and communal insecurity to the list of structural violence mechanism present. The alleged presence of a few hundred former Liberian and Sierra Leonean fighters who rejected the disarmament and demobilization process in their own country nearly ten years ago chose to remain in the region, and of several dozen members of the traditional Dozo hunters’ brotherhood that were driven from Nzerekoré in 2012 for frightening the local community remain at large. They are a constant source of rumours and worry for the communities of Forest Guinea. Although both of these groups have not yet actually been inculpated in any violent event in Forest Guinea, they are frequently reported to be instigators or participants in them. From the perspective of the local community, the effects of decades of exploitation and extractivism by foreigners who enrich themselves to the detriment of local communities on one side, and of violent interventions by an indifferent state on the other side, any outside intervention is viewed with suspicion and mistrust. The Ebola outbreak made this more than evident. As outside health workers and officials visited remote villages and towns, anxious residents reacted with not only fear but also violence. Womey was but the most publicised event, but there were many others involving fumigation crews, clinic staff, funerary units, and other outreach teams. More than previous crises, the Ebola outbreak has shown how the socio-political marginalization and the geographical isolation of Forest Guinea influence its own instability. It also brought to the surface the complex interrelations between communities, external actors, and the state that characterize Forest Guinea. Misunderstood cultural practices and religious customs on the one hand, and overwhelming outside intervention and a marked increase in state and military presence has fuelled distrust, fear, and ultimately weakened the traditional social fabric of the region. The unprecedented nature of the epidemic and of the response associated to it disturbed the fragile balance of the communities as elders and other leaders proved unable and unprepared to deal with such a devastating event. It took a concerted effort by national and international actors to stabilize the situation. The lessons learnt from the latest crisis have been considered mainly in terms of public health. However, it is clear that the region’s concerns go beyond inadequate education and medical care. Overall, the central government’s failure to address local and regional concerns promptly and objectively is at the centre of all instances of distrust, fear and violence in Forest Guinea. A holistic and culturally sensitive strategy must be developed for long-term reconciliation measures to be effective. Guinean authorities need to establish fair and independent legal procedures in order to foster peaceful ethno-religious co-habitation and also to eliminate the perception of Malinké favouritism and impunity. Additionally, the Guinean government should focus on improving statutory land use policies and regulations in Forest Guinea so that local customs are taken into consideration, thus rendering central authority both relevant and authoritative. Business agreements should be revised in order to include local development as a priority. Ebola has underlined the need to consider the transnational dimension of dealing with Forest Guinean issues since similar socio-cultural dynamics occur in the forest areas of neighbouring Côte d’Ivoire, Liberia and Sierra Leone. The outbreak of major disturbances in Forest Guinea could easily undermine fragile national stabilities on both sides of the border since both the Liberian Nimba and the Ivorian Grand Ouest are characterized by a similar difficult cohabitation between native forestier and non-native Malinké communities. In these areas, land conflicts and cultural divides are also often exploited by political actors and have increasingly resulted in violence. Given that the Ebola crisis is far from over and that in the next few months both Guinea and Côte d’Ivoire will hold presidential elections national governments and the international community should keep in mind the underlying fragility of the region. Special monitoring should be set up in these regions to guarantee transparency and equity of the vote in order to avoid political distrust and intercommunal tensions that could easily mutate into violence and chaos. Beatrice Bianchi is a political expert with over five years of work and research experience in Sub-Saharan African politics and human rights monitoring. As a consultant for various international IGOs and NGOs she has focused on democratization process and on fragility factors assessment, including security sector reform, land conflicts, and the justice system. Most recently, she was political analyst for the EU Electoral Observation Mission in Guinea (2013) and Malawi (2014). Beatrice was a Gates Scholar and holds two Masters degrees, one in African Studies and the other in International Politics from the University of Cambridge and the Université de Paris1 Panthéon-Sorbonne, respectively. She has lived and worked in Ethiopia, Kenya, Burkina Faso, Malawi and Guinea. The four natural geographical regions of the country are defined by four major ethnic communities: Fula (40% of the total national population) live primarily in Central Guinea, Malinké (30%) in Upper Guinea, Soussou (15%) in Coastal Guinea, and forestier (15%) in Forest Guinea. Other than the capital district, Forest Guinea is the only area where significant native and non-native populations cohabitate. We must note that Sekou Touré himself was a Malinké, and this fact was not lost upon the forestier. For more information on the Demystification Program see: Mike McGovern, Unmasking the State: Making Guinea Modern (Chicago, 2012). Semi-traditional structures of authority that represent the interests of each regional community. Of note is the fact that Nzerekoré electoral district is predominantly forestier. For comparison, the national average of annulled votes was 5%. See: Mission d’observation électorale de l’Union Européenne en République de Guinée, Rapport final – élections législatives. Brussels (2013). The most violent episodes took place in Yomou district where people protested against a government majority-owned palm oil and natural rubber producing company (2011) and in Nzerekoré district where the local populations attacked and damaged a nearby iron-ore mine (2012). Both events were severely repressed by the army. These Malinké people extend across Guinea, Côte d’Ivoire, Mali and Burkina Faso. This particular group was a subset of a larger group that had been accused of causing violence and unrest in Conakry a few months previous to their emigration to Forest Guinea. See: International Crisis Group, Guinée: sortir du bourbier électoral. Rapport Afrique 199. February 2013. See: MDT-Avocats sans frontières Guinée, « Rapport conjoint sur les affrontements intercommunautaires dans les préfectures de Nzerekoré et Beyla », September 2013. MDT-Avocats sans frontières Guinée, « Rapport Womey », January 2015.